As an Environment and Energy Company group providing solutions to help tackle humanity’s greatest challenge – global environmental issues – the Nisshinbo Group is creating a framework to support the implementation of environmental management. We have set medium- and long-term environmental targets that dovetail with our business plans. By achieving those targets, we aim to help create a sustainable society. LCAs involve quantifying the environmental burden and potential environmental impact on the planet and ecosystems of all inputs during a product’s lifecycle, from materials sourcing through to disposal. LCAs provide a useful benchmark for designing environmentally friendly products. Products and services that contribute to the realization of a sustainable society are defined in accordance with the OECD classification for environmental businesses. Products and services that do not come under that definition are assessed using rigorous internal standards. To contribute to humanity through our business activities, we are working to grow sales based on a holistic approach to production and sales. The Group is introducing solar power systems and switching to LED lighting, mainly at manufacturing sites in Japan and overseas. The Group also selects highly efficient energy systems when upgrading facilities. Most greenhouse gases originate from energy sources, so lowering greenhouse gas emissions and reducing energy usage are closely linked. Another key measure is reducing CFCs, which have a high global warming potential. CFCs are used in semiconductor fabrication processes. We are installing systems that break down those CFCs, leading to lower emissions. Greenhouse gas emissions started falling due to a drop in energy usage in the textiles business. PRTR substances are chemical compounds that are harmful to people and ecosystems. We have minimized emissions of PRTR substances by switching to alternative low-toxic chemical substances in manufacturing processes. Emissions rose due to higher emissions at Nanbu Plastics Co., Ltd.
We are working to reduce raw material and packaging material volumes and effectively reuse waste. We are focusing on raising recycling rates at overseas sites. We are actively installing solar power generation systems at business sites that require large amounts of energy, such as facilities that use thermal processing. 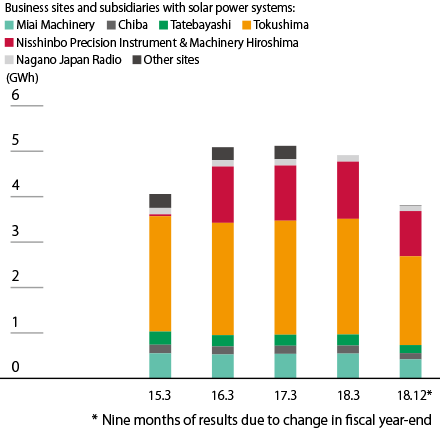 In the fiscal year ended March 2018, installation work was mainly carried out at domestic sites, helping to lift the Group’s total solar power generation to 4.9GWh.